Right now is a great time to assess the state of your home! Doing small repairs and preventative maintenance now can save you time, money and hassle in the long run. 1. Care for trees and shrubs. If you have trees on your property, consider hiring an arborist to care for them — these pros can spot signs of poor health early on to prevent tree loss, and know how to prune properly to avoid falling limbs in winter storms. Because trees are slowing growth in the fall, it’s not an ideal time to plant a new tree, as the roots may have trouble getting established. For treatments, a fungicide injections in the fall can prevent diseases, such as diplodia, which can affect pine trees. It’s also a good idea to observe your trees throughout the fall, keeping an eye out for signs that signal a need for intervention. Any early color turning, spotty color turning, brown needles on pine trees, are all things to keep an eye out for. 2. Rake leaves. Leaves look beautiful blanketing the ground, but leaving too many leaves on a lawn over winter in a snowy area can inhibit spring growth. To make the job easier, choose a lightweight rake, wear gloves to protect your hands and use handheld “leaf scoops” to bag leaves quickly. 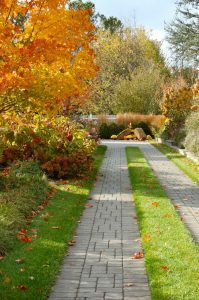 If leaves are dry, you can use a blower, some have attachments that will mulch leaves too. Check out your local Lowes or Home Depot, for good fall deals on leaf blowers. 3. Clean gutters and downspouts. Once most of the leaves have fallen, clean out gutters and downspouts (hire a helper if you are not comfortable on a ladder). Clogged gutters during rainstorms can cause water to pool and potentially damage your roof or siding. 6. Check walkways, railings, stairs and the driveway for winter safety. When the landscape is covered in ice and snow, just walking from the driveway to the front door can be quite a challenge. Make navigating around your home safer and easier by checking that all stairs are in good shape and have sturdy railings, and that the driveway is in good repair to make for easier shoveling. -Check the condition of snow shovels and ice scrapers. -Pick up a bag of pet and plant safe ice melt. Sand, and even cat litter, are also more eco-friendly alternatives to ice melt, and it wont damage your concrete or decorative pavers. -Restock emergency kits for car and home. -Have your snow blower serviced and purchase fuel. -Stow your lawn mower. Either drain out the gas or add a fuel protector to extend the life of you gasoline. -Test smoke detectors and carbon monoxide detectors. Replace batteries in all units in your home (once a year). -Check the expiration date on your fire extinguisher. Replace if needed. 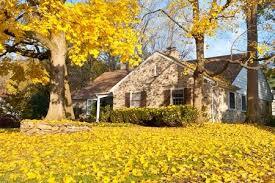 -If you haven’t checked your home for radon, fall is a good time to do so. 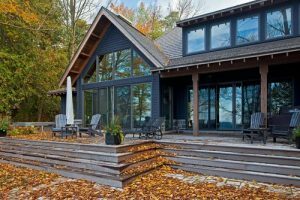 As the weather gets cooler and windows stay shut more often, radon is more likely to become trapped in your home. 12. Clean dryer vents. Lint buildup in dryer vents can make your dryer work less efficiently and even cause a fire. The cool, dry fall weather increases static electricity, which can ignite lint that has built up, so now is a key time to get that lint out. You can hire a duct cleaning specialist to clean the vents for you, or clean the vent yourself. 15. 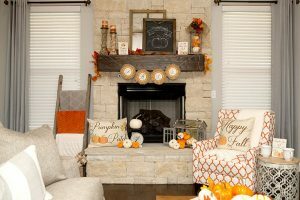 Schedule a chimney cleaning and heating system maintenance. Making sure your chimney and furnace or boiler are cleaned, maintained and in good working order before temperatures dip is a good idea. Be sure to add a chimney cap if you don’t already have one! It will stop small critters from crawling down your chimney!